Developer Quote: "Feeling left out by an entire race of racing rabbits, Tufts our cute and lovable bunny needs to prove himself to everyone." It's the perfect holiday season to be thinking about bunnies as you admire a cast of adorable ones and their silly antics. This app is all about Tufts. He is a rabbit with a cause - that being to prove his worth to friends and family. With the help of his Grandpa, Tufts eventually obtains special status and acknowledgment that he is the champion rabbit racer amongst his cohorts. Enjoy multi-player action with dialog that is arranged so that even young ones can understand the activities and meaning. 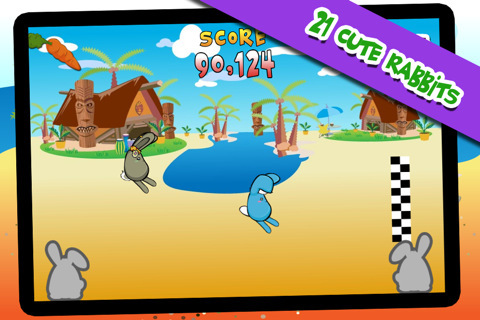 You will be playing with a cast of bunnies that are colorful in character and display. COOL CONCLUSION: "Rabbit Race is the perfect family game that will amuse and delight with cute bunnies speaking catchy lines." --Special Note: Free only for today!